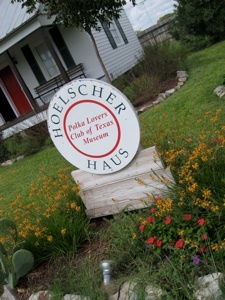 The Polka Lovers Club of Texas Museum - Hoelscher Haus is located next to the Texas Czech Heritage and Cultural Center and Fayette County Fairgrounds in La Grange. The renovated 1870s home was donated by the Hoelscher family to the Texas chapters of the Polka Lovers Klub of America (Po.L.K. of A.) and opened in 2006. The museum features displays of photos, records (remember those? ), instruments and Po.L.K. of A. memorabilia. Visitors can now access the second floor of the museum with an elevator chair. The top floor has an extensive library of polka music dating back to the early 1900s and the right machines to play the vinyl on. Future plans call for building a patio, perfect for dancing, of course. There is no admission charge and tours are available by appointment and during events at the Texas Czech Heritage Cultural Center.